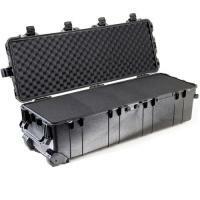 Pelican 1740 Long Case 40.98" x 12.92" x 12.51" FREE SHIPPING! Home > Pelican > Equipment Bags > Long Gun Carry Bags > 1740 Long Case 40.98" x 12.92" x 12.51"
Pelican 1740 Long Case 40.98" x 12.92" x 12.51"
Pelican's 1740 Long Case accommodates wide variety of gear, especially over-sized items that can't fit in standard cases. The 1740 is constructed of sturdy polymer with an open cell core design, keeping it as light as possible without sacrificing strength. The addition of Pelican's six-piece Pick-N-Pluck foam set only adds five pounds to the overall weight. Standard to the brand is their signature auto-pressure equalization valves and watertight O-ring seal, ensuring water and dust are kept out. Easily open the case using its Double Throw latches. Transporting the case is convenient with the grippable handles and wide-track polyurethane wheels with lasting stainless steel hardware. You can even securely stack multiple cases for maximum storage, employing the four deep-locking cleats. Interior Dimensions (L x W x H): 40.98" x 12.92" x 12.51"
Exterior Dimensions (L x W x H): 44.02" x 16.02" x 14"
©2002-2019 CopsPlus.com: Pelican 1740 Long Case 40.98" x 12.92" x 12.51" FREE SHIPPING!